The 24-year-old debuted her stunning new look on the cover of this month's British Vogue, and her man is clearly a big fan! After Ariana shared the pics to her Instagram on Monday, the "SNL" star gushed, "Ummmmmm hiiiiiiiiiiii. I'm the luckiest contest winner ever." Ari adorably hit back with, "Nahhhh i am" along with a jumble of letters to represent her loss for words. Too cute! 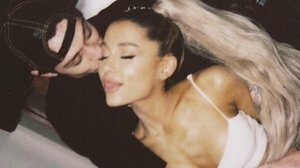 The couple went public with a cute "Harry Potter"-themed snap on Pete's Instagram earlier this week, and Ari followed up with a PDA photo of Pete giving her a smooch on the cheek. Pete even made his love for the "No Tears Left To Cry" singer permanent with two tattoos – a black bunny mask behind his ear and "AG" on his thumb. Looks like Ariana and Pete are living on "Honeymoon Avenue!"